FHL’s Table Talk – 3rd Year Anniversary! Thank God for sustaining the monthly collaboration of food ministries and other community agencies in addressing hunger holistically. Sharing best practices, challenges, victories and praying for each other. 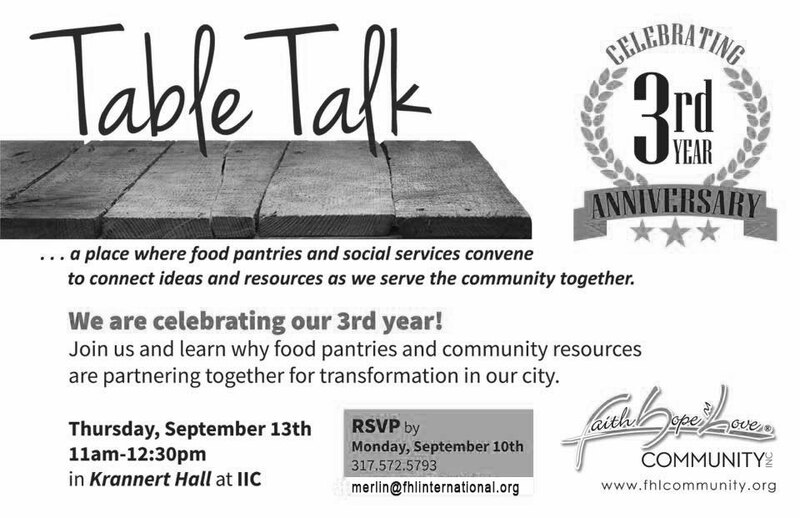 Monday, Sept 10th, FHL celebrated the 3rd year Anniversary of FHL’s Table Talk. at IUPUI, 1100 w 42nd St Indianapolis 46208, the 2nd floor at Krannert Hall at 11am. Our website will soon feature a page dedicated to Table Talks and their upcoming schedule and topics.